The Southern California Gas Company recently released information regarding the closing of Sullivan Canyon to the public (see below for the press release). A comment was made on our blog alleging that the area had been closed due to an incident involving a mountain biker being seriously injured. According to Public Affairs Manager Krista Phipps, the area was not closed as a direct result of the incident, but in response to several factors. “I was told by the Project Manager that [the incident which caused injury to the mountain biker] did not occur at the construction site. However, it was serious and required the person to be airlifted out of the canyon. Overall, there have been a series of close calls in and around the construction site and we just do not want to risk injury to the public or our employees,” said Phipps. Please note that Sullivan Canyon is NOT public property. It is owned and operated by the Southern California Gas Company which maintains it as open to the public unless work to the gas line is necessary. The Gas Co. can rescind permission to access Sullivan Canyon at any time. In this case, many users will be effected, not just mountain bikers. This surely will come down to a blame game with mountain bikers bearing the brunt of criticism, and to a large degree rightly so. All we can ask is that you ride safely for the conditions, and remember that your actions represent the entire mountain bike community. In follow up to the notice of September 17, 2012 regarding the Sullivan Canyon Maintenance Project, this correspondence is to inform you that in spite of our efforts to complete the project without impeding public access, we have determined that in order to maintain public safety, Sullivan Canyon will be closed to the public during the hours of 6am to 6pm Monday thru Saturday, effective immediately. This schedule will be maintained throughout the duration of the project to ensure safe operation of two high-pressure transmission pipelines located in the canyon. The project is expected to be completed by December 31, 2012. Please note that this completion date is an approximation and may change due to the needs of the project. Additional closures and/or further restrictions will be posted on the gate at Queensferry Road and at the entrance to the property off of Mulholland Drive in advance, to the extent feasible. We apologize for the inconvenience caused by this necessary work to ensure pipeline safety and maintenance of a reliable natural gas supply to the Los Angeles basin area. SoCal Gas appreciates your understanding of the need for this maintenance work and temporary disruption of canyon access. It is our goal to keep disruptions to a minimum and we regret temporary inconveniences. Safety is our first priority. We appreciate customers and members of the community keeping us informed on conditions surrounding our facilities. Please feel free to share this notice with your networks which have an interest in the canyon. Thank you for your understanding while we perform this necessary maintenance and repair work. Should you have any questions, please call me at (323) 371-0011 or email me at kphipps@semprautilities.com. CORBA has learned that NPS administrators were ready and willing to temporarily close trails in reaction to the issues of increased complaints and collisions listed in the press release. However, due to the trust and reputation that has been fostered and maintained through CORBA’s advocacy efforts with NPS, trail closures were not implemented at this time. Let’s show that we are a responsible user group by slowing down and showing courtesy to our fellow trail users. It’s simple: Slow down, solve the problem. 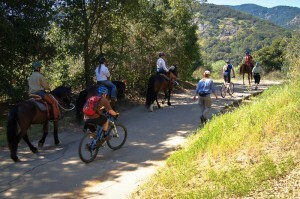 THOUSAND OAKS, Calif. – In response to increased complaints and collisions on local trails, the National Park Service (NPS) has teamed with the Concerned Off-Road Bicyclist Association (CORBA) to promote safe and courteous riding in the Santa Monica Mountains. Rangers report an uptick in visitor complaints regarding cyclists who are riding too fast or in restricted areas. Particularly on busy weekends, the effects can be dangerous. In the past year, accidents at Cheeseboro/Palo Comado Canyon resulted in several helicopter extractions, though the problem is not limited to that site. Turner, who is an avid mountain biker herself, wonders if a new website that allows riders to publicly post their times on specific trails has led to an increase in violations. Strava (www.strava.com) shows speeds of up to 35 mph, with average speeds of 25 mph, on some trails within the recreation area. Made aware of the problem, Strava is working with Turner to prohibit users from posting times on certain trails, along with a message about trail regulations. As part of its mission to promote safe riding, CORBA is working closely with SMMNRA, a unit of the National Park Service, to inform its members about these concerns and remind them about responsible riding tips. Turner attended a recent CORBA meeting and is visiting local bike shops to let the community know that rangers will be stepping up patrols and issuing citations. Both organizations hope the efforts will result in a safe and enjoyable trail experience for all users. 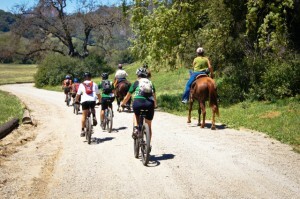 Concerned Off-Road Bicyclists Association was founded in 1987 to serve the mountain bicycling community of Los Angeles and surrounding areas including southern Ventura County. CORBA is a 501(c)(3) non-profit organization committed to gaining and maintaining public trail access for mountain cyclists and the public at-large. 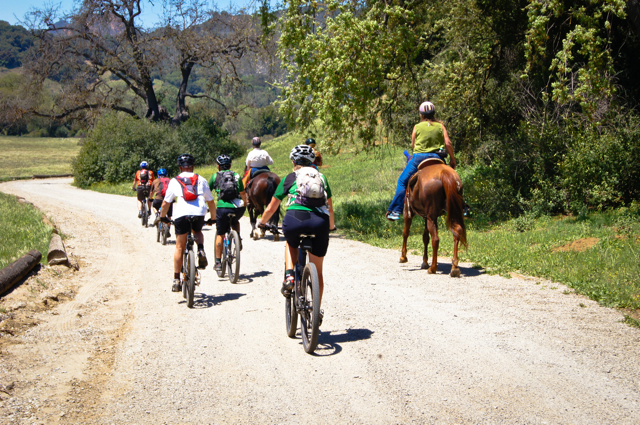 CORBA encourages and promotes the safe and environmentally responsible use of unpaved roads and trails for bicycling and to educate the public about all aspects of off-road cycling and trails. www.corbamtb.com. It has come to our attention that it is possible that small group of mountain bikers is using the web site Strava to have “competitions” in various locations around the Santa Monica Mountains National Recreation area. Strava allows you to track and upload your outings onto their web site via a GPS tracking device. The data ncludes the time it took you to traverse a particular route. It seems that some mountain bikers are using this feature to create a “time trail” competition and posting their times to see who is fastest. Obviously, trying to go as fast as possible on our shared use trails is not acceptable as it can endanger other users, including but not limited to mountain bikers. In response to this situation, we have learned that National Park Service rangers will be intensifying their presence at locations known to be experiencing this time trial scenario, Cheeseboro Canyon Park in Agoura Hills being one of them. 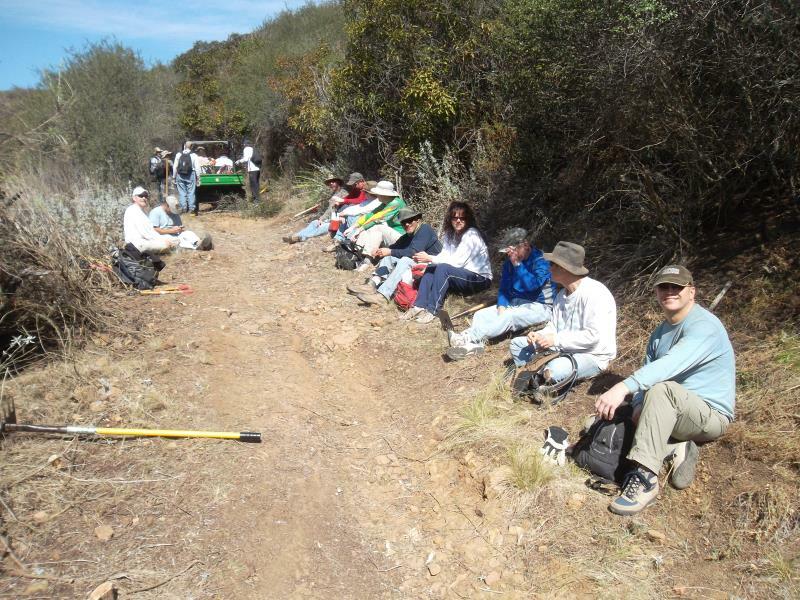 Currently it is the policy of the Santa Monica Mountains National Recreation Area’s managing agencies that events that displace or affect the safety of other trail users on public open space trails are prohibited. If you want to race, go to a sanctioned race (usacycling.org). If you want to go fast, go to a location that is set up for high speed mountain biking, such as Mammoth Mountain (mammothmountain.com). 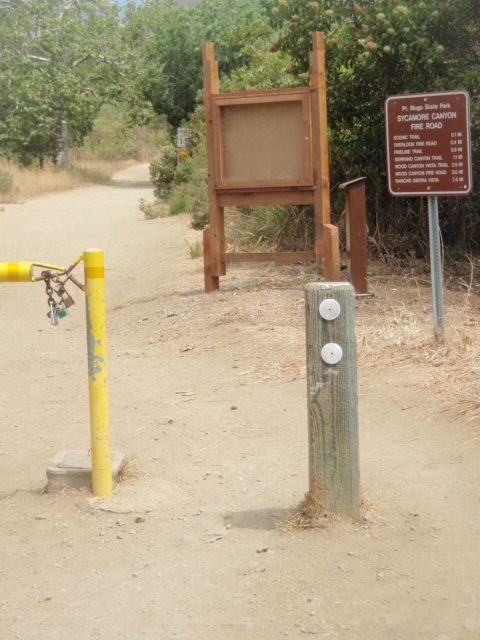 Newly installed donation station and info kiosk at Sycamore Canyon entrance to Point Mugu State Park. As posted here recently, CORBA has been nominated for the Mountain Bike Hall of Fame by Hall of Fame member and long-time CORBA Supporter Dr. Al Farrell. The deadline for voting is July 15, and you must be a member of the Hall of Fame to vote. 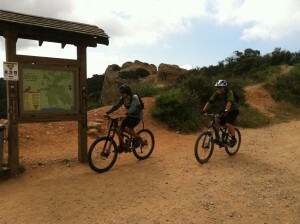 Our fight to re-open The Canyon Trail and Vasquez Rocks to mountain biking continues. As a part of the “trail assessment process” the County is undertaking, a “first” public hearing will be held on this matter on Wednesday, February 15 at 7PM at William S. Hart Park in the “Hart Hall” building. This is a very important meeting and we need all hands on deck. So please mark your calendar and plan on bringing your spouse and kids and maybe a few “Share the Trails” signs. More information will follow as we plan for this meeting. Additionally, next week, some of our committee members will be meeting with Russ Guiney to discuss the status of our request to re-open these trails and to express our concerns about the process and approach they are undertaking to address this issue. Mr. Guiney is the Director of LA County Parks and Rec and the buck does stop with him. Ultimately, this is his decision. Wish us well. Thank you for your support and letters to Supervisor Antonovich. We would not have made it this far without it. See you on the trials! 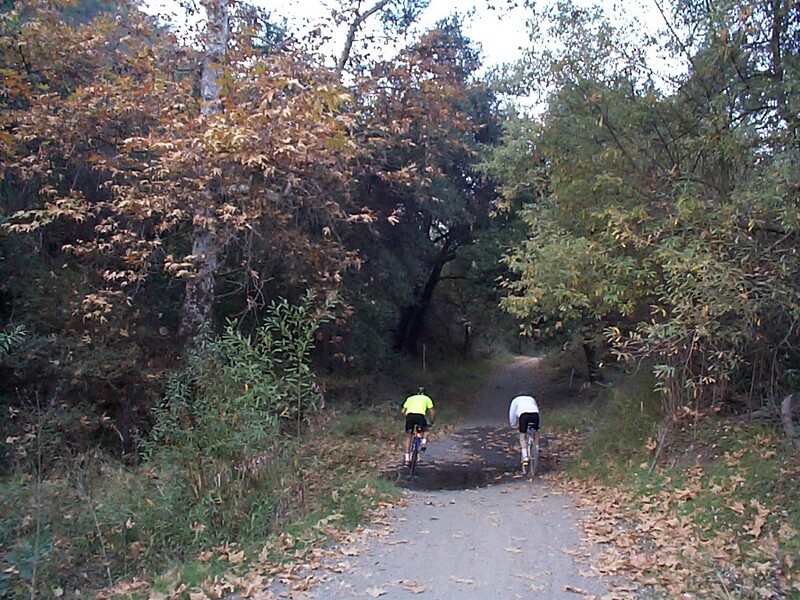 To add your name to our email list, please email SCVTrailUsers@gmail.com with such a request.